Tonight: Gaudreau vs Kane in Battle of Silky Skaters, Playmakers - The Point Data-driven hockey storytelling that gets right to the point. Two of the silkiest playmakers in the game square-off tonight in Chicago as Johnny Gaudreau and the Flames take on Patrick Kane and the Blackhawks. Get ready for some coast-to-coast, edge of your seat type rushes from the slick skating Americans who both lead their respective teams in goals, assists and points. They also are among the league leaders in a number of key areas that speak to their elite skating / playmaking ability. 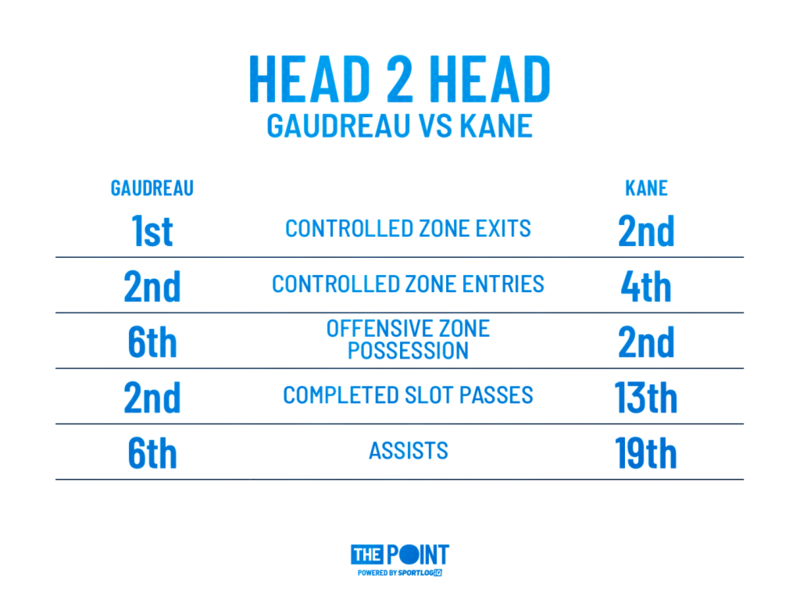 Gaudreau and Kane are among the best in the world at exiting the zone with possession of the puck, weaving through traffic in the neutral zone and gaining the attacking blueline. Gaudreau leads the NHL in controlled zone exits, averaging 11.8 per game. 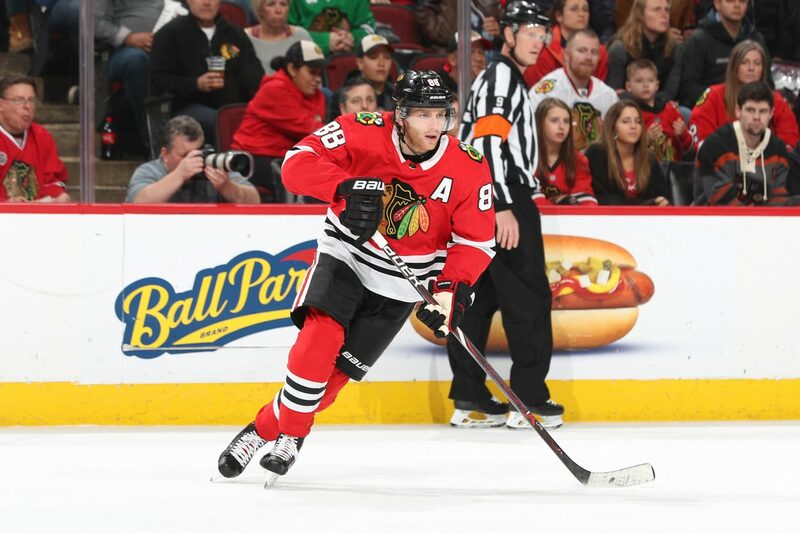 Kane is right behind him, 2nd at 11.7 per game. 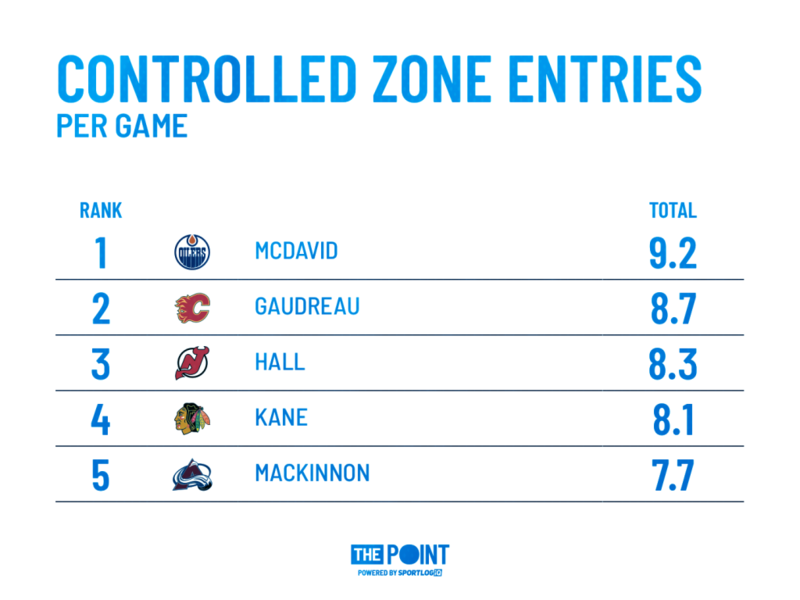 As for gaining the offensive zone with possession, only Connor McDavid averages more controlled entries that Gaudreau. Kane also ranks top-5. Once in the offensive zone, Gaudreau and Kane have the poise and talent to hang onto the puck, waiting until the right play presents itself. Kane routinely led the league in offensive zone puck possession until Mat Barzal came along. Kane finished 2nd to Barzal in the amount of time he had the puck on his stick in the attacking end last season and ranks 2nd to Barzal again this season, averaging 1:15 per game. Gaudreau is also top-10, ranking 6th at 1:05. Gaudreau and Kane can fill the net, with a team-leading 24 and 23 goals respectively however, they are pass first players who do an excellent job funnelling pucks into contested areas in the offensive zone. Gaudreau has completed the 2nd most passes into the high-danger slot area of any player in the league, Kane ranks 13th. For a complete list, check out the ‘Statistics’ page of our website. Because both players are able to set teammates up for quality looks at such a high rate, it’s no surprise they are both top-20 in assists. Add it all up and it’s clear to see that Gaudreau and Kane are two of the most dynamic transition players and set-up men in the game. If you’re watching the game tonight, pay attention when these guys get the puck in the defensive zone. No two players break it out more often and once they pick up speed through the neutral zone, highlight reel plays often follow.